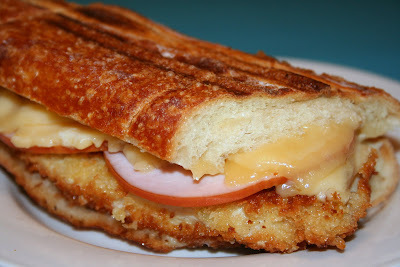 I love sandwiches, and I love Chicken Cordon Bleu, so why not combine them? Quick and easy to prepare - this grilled sandwich will please even the most picky of eaters, especially considering you can adapt the recipe to suit all tastebuds. Don't like Havarti? Try Mozarella or stick with a traditional Swiss. Serve this alone for a quick lunch or add a side salad or cup of soup for a comforting dinner. However you serve it - just serve it. Fantastic! Heat the olive oil and butter in a large saute pan over medium-high heat. In three shallow, rimmed bowls place flour, egg and bread crumbs in each dish. Season the chicken with S & P and dredge each piece in the flour, then egg, then bread crumbs. Place the breaded chicken into the pan and saute for about 4 minutes per side until thoroughly cooked. Transfer the chicken to a separate plate and set aside. Preheat a panini grill to medium-high heat. Prepare sandwiches by coating insides of bread with favorite condiment if desired, then layer with chicken, Canadian bacon and cheese. Grill about 3-5 minutes until the cheese is melted.